The electrification of homes and businesses revolutionized American life in an unprecedented manner. The electric lamp gave people complete control over lighting inside their homes and workplaces. The natural biological rhythms of day and night/light and dark were overturned. No longer were we bound to the natural cycles that ruled mankind since our beginning. Both home life and the workplace experienced unprecedented change. The workplace could now effectively be done on a 24 hour schedule. If desired, more than one shift of workers could run the factory each and every day. 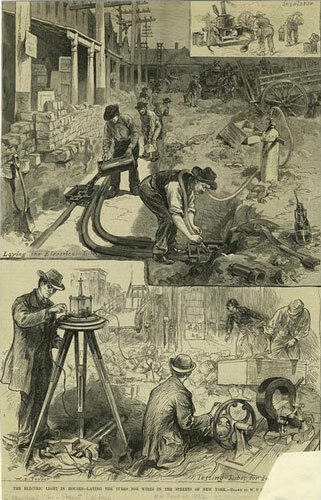 The incandescent light was almost as effective at illuminating tasks as was daylight. As a result the design of buildings also started to fundamentally change. No longer were building foot prints determined by the need for daylighting. In fact, daylighting soon became seen as a supplemental source of lighting rather than its primary means. Electricity for elevators (along with the development of the curtainwall) helped usher in the development of the high-rise building. No longer were buildings limited in height because of the user’s unwillingness to walk up a building more than about six stories. In the home electrification helped reduce the drudgery of the middle-class housewife. Small electrical appliances were developed for ironing, vacuuming, clothes washing, and refrigeration. Tasks that used to take all day could now be done in a manner of hours. Electricity also created a new hearth – the radio. The family now gathered around the radio and connected to the outside world in an unprecedented manner. Music, news, weather reports, and entertainment were all immediately accessible. With the advent of electricity the world became a much smaller place. In popular culture Thomas Edison has been given credit for inventing the incandescent lamp. In fact there were over twenty documented scientists/inventors from all over the world who contributed to its development over an eighty year span. In 1802, Humphry Davy was experimenting with incandescent lighting at the same time he was experimenting with arc lighting. He created the first incandescent lamp by passing current through a thin strip of platinum. He chose platinum because of its high melting point but it quickly burned out and was too expensive to be practical. In 1840, the English scientist Warren de la Rue also passed an electric current through a coiled platinum filament enclosed in vacuum bulb. The vacuum increased the life of the filament but not enough to justify its high cost. For the next forty years a large variety of materials were experimented with including chromium, iridium, molybdenum, carbon, carbonized paper and wood. In 1879, Edison successfully tested a lamp that utilized a carbon filament that lasted for 13 ½ hours. He continued experimenting and he discovered that a lamp with a carbonized bamboo filament would last over 1200 hours. But developing the lamp technology was only one of the challenges that Edison faced. He had to create a workable delivery system, methods to wire buildings, develop workable switches, luminaires, and most importantly an efficient dynamo to generate the electricity. He found a workable direct current dynamo that was designed by an engineer named William Wallace and that had an output of 6.0 kW. By 1880 Edison had made enough advancements to create the Edison Illuminating Company. The company created the first investor-owned electric utility in 1882 at the Pearl Street Station in New York City. It eventually served one square mile with six large dc dynamos with each producing 10 kW. The system cost $300,000 to build with the installation of 100,000 feet of underground conduits. But direct current systems had their limitations. First, after approximately one-half mile the current quickly diminished and couldn’t easily be bolstered. Second, direct current lines could deliver 110 volts, but more powerful currents to run motors couldn’t travel over the same lines. When George Westinghouse became interested in electricity he came to realize these shortcomings and understood that alternating current (ac) systems avoided these problems. It could be efficiently transmitted over long distances and the voltages could be easily stepped down. In 1886, he contracted with Nicola Tesla to help develop alternating current systems for Westinghouse. After immigrating to the U.S. in his twenties, Tesla briefly worked for Edison who never really acknowledged his talents and when there was a dispute over a promised pay bonus he quit. In anger he went to work for Westinghouse. Edison publically condemned alternating current and led a self-serving crusade against its use. He charged that because of its higher transmission voltage it would never be free of danger and frequently referred to it as the “executioners current”. To prove his point he even promoted several high profile electrocutions of animals to prove his point. In response, Westinghouse went to great lengths to assure the public of its safety. 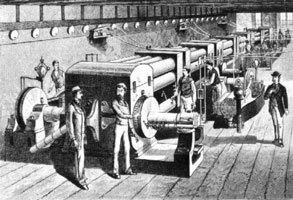 The competition between Edison and Westinghouse became very public and quite bitter and became known as the “War of the Currents”. 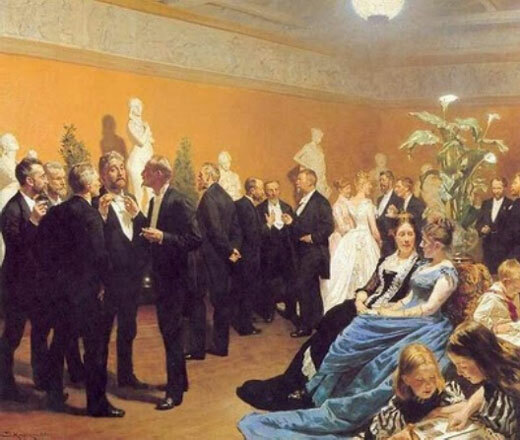 Over time as the advantages of alternating current started to be recognized and concerns for its safety minimized its use started to rapidly expand. By 1891 there were almost five times as many alternating current stations in the U.S. as direct current stations. 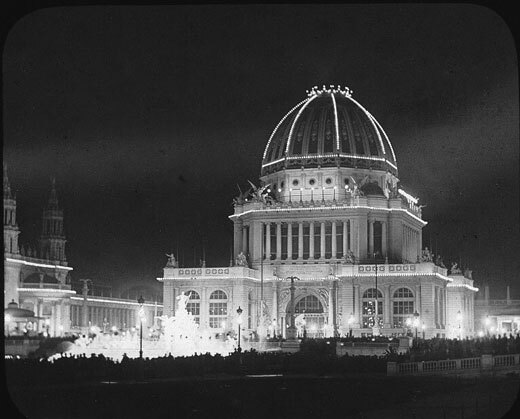 The competition between Edison and Westinghouse came to a head when they both competed to supply the illumination for Chicago’s Columbian World Exposition in 1893. Westinghouse along with Tesla’s polyphase ac generators outmaneuvered Edison and his dc power in getting the lucrative and highly visible contract. Once fully installed the electric lighting of the exposition consumed three times the electrical power of all of nearby Chicago. Every night 200,000 incandescent lamps outlined the edges of the buildings and lined the boardwalk and even more illuminated the dozens of building interiors. In the Electricity Building the public saw exhibits of the latest motors, engines, welding machines, and a myriad of electric devices and tools. 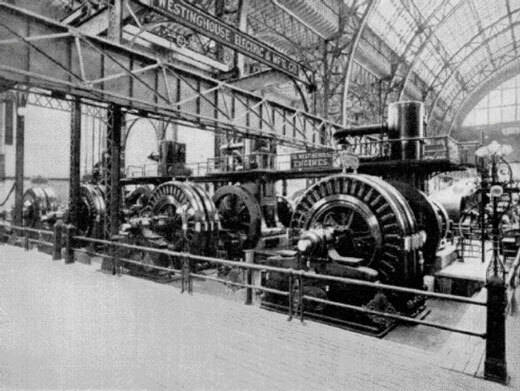 In the Machinery Hall the public saw Tesla’s twelve giant, 75 ton dynamos generating the electricity for the entire exposition. Never before had there been such an astounding display of the future of electrical power. Eventually alternating current systems came to be the standard for electrical generation in this country and Edison’s dc systems were relegated to the past. Improvements continued, especially in lamp development, and in 1906 the General Electric Company patented a design for a lamp that used ductile tungsten for the filament that was truly commercially viable. Its design has remained essentially unchanged from today’s incandescent lamps. The chemistry of gas combustion in gas lighting was quite unhealthy. It produced water vapor and smelly fumes. Small gas lit rooms became unhealthy rather quickly and most rooms had to have a window cracked open to let in fresh air and ventilate disagreeable fumes. The fumes frequently damaged fabrics, tarnished metals, and left unsightly stains and deposits on walls and ceilings. Incandescent lighting changed all that. It provided a clean, safe, and immediate light source. But the early lighting systems were not without problems. The bare clear non-directional lamps were significantly brighter than gas lamps and created an even and overly flat light with harsh shadows. 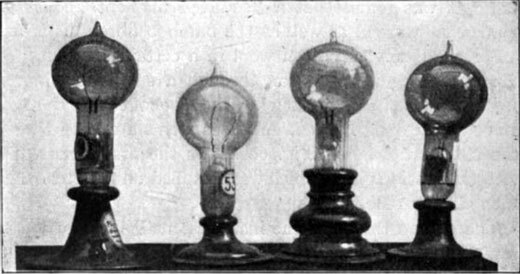 The lamps were not always well-screened and users were commonly subjected to direct glare. But nevertheless it was a significant improvement over gas lighting and laid the groundwork for improved lighting in the 20th C.